Heat oven to 350°F. In large bowl, break up cookie dough. Stir or knead in oats and salt. Reserve 1/2 cup dough for topping. In ungreased 9-inch square pan, press remaining dough mixture evenly in bottom to form crust. Bake 10 to 12 minutes or until dough puffs and appears dry. In small bowl, mix caramel topping, flour and vanilla until well blended. Sprinkle walnuts and baking chips evenly over crust. Drizzle evenly with caramel mixture. Crumble reserved 1/2 cup dough mixture over caramel. Bake 20 to 25 minutes longer or until golden brown. Cool 10 minutes. Run knife around sides of pan to loosen bars. Cool completely, about 1 hour, 30 minutes. For bars, cut into 4 rows by 4 rows. Store tightly covered. Totally totable, these classic layered bars are perfect for get-togethers with family and friends. Turning your favorite classic cookie into your favorite bar is just another perfectly delicious way to enjoy cookie dough. 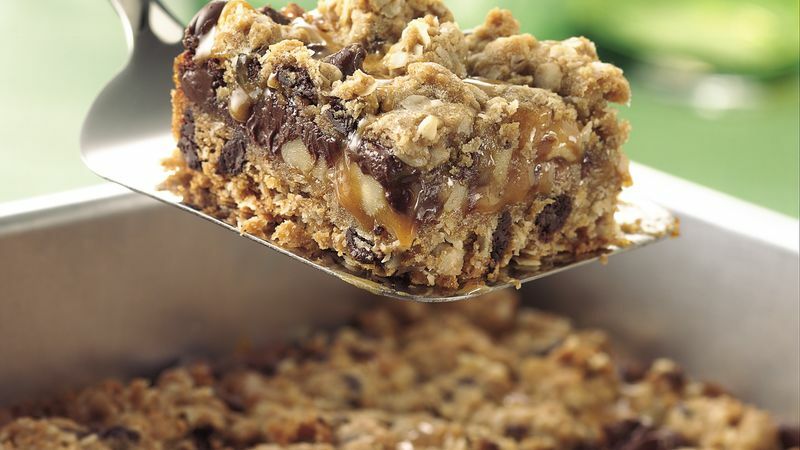 These chocolate chip caramel bars get a quick head start from Pillsbury chocolate chip cookie dough, but it’s important to note that although cookie dough is extremely versatile, it still needs to be treated delicately when it’s re-purposed for another dessert. First, always use the size of pan that’s specified in the recipe. This may seem like a no-brainer but it will affect not only the taste and texture, but the final appearance, and may result in crumbly, inedible bars. Second, don’t even bother to try to cut the bars until they have cooled completely. You should set the entire pan on a wire rack to allow them to cool. Some bars may crack on top when you try to cut them. To prevent this, lightly score the cutting lines on the top with the tip of a knife while the bars are still warm. Wait to cut them all the way through until after they are cooled. For more hacks and cookie recipes, you can visit our article on how to make the best cookies ever. Or if you’re already a cookie pro, why not try another oatmeal cookie recipe? Hershey's trademark and associated trade dress are registered trademarks of the Hershey Company used under license.